Price: Adults: $5; Seniors $3; Students $2; Call to schedule free school tours, evening tours, private parties or inquire about group rates. Time: Tu-Sa 10 a.m.-4 p.m. The Alexandre Mouton House gets all dressed up for Christmas! Local florists and artisans adorn each room of this circa 1800 home in decorations reflective of the period. 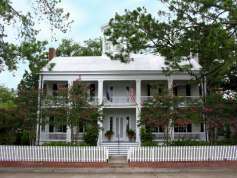 The home is open for visitors Tuesday - Saturday, 10:00 a.m. - 4:00 p.m.